Industrial designer Joey Roth has just three products for sale—but his elegant “Sorapot” teapot and his porcelain ceramic stereo speakers have attracted critical acclaim and a cult following among design aficionados. 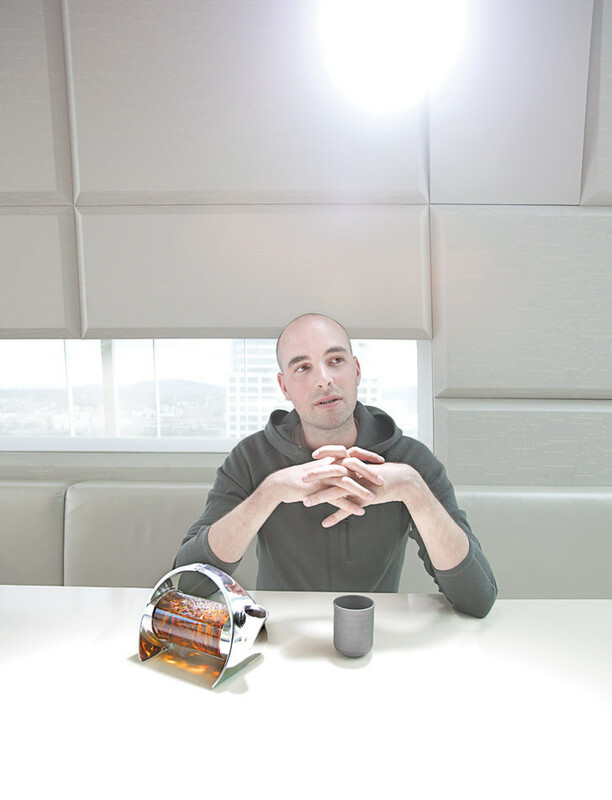 Now that he’s traded San Francisco for the city of Portland, Roth plans to expand his one-man company with a new desk lamp, a full tea set, a pour-over coffee system, and more. IN HIGH SCHOOL, I wanted to be a writer. It was an opportunity to create a world. But as I was exposed to a more critical reading of authors I loved, I realized they had already said everything I wanted to say. It would be a complete waste of my life to just add inferior versions of what was already out there. I discovered this thing called industrial design—designing products to become part of people’s everyday experience. Design combined the world-creation of writing with a field where I felt that I could do better than what was out there. I STARTED DESIGNING the Sorapot, my teapot, at the end of my junior year of college. It was never intended to be my first product, but Cool Hunting picked it up off my website. People didn’t realize it was just some college kid’s project, and I started getting inquiries from stores. I suddenly realized there was a whole way to work as a designer that I hadn’t thought about—I could build my own company. IN SAN FRANCISCO, when you tell someone you’re working on engineering and prototyping, they assume you’re talking about software. No one remembers that you can engineer and prototype actual physical objects. In Portland, people tend to assume that I have a warehouse where I’m working at a potter’s wheel, hand-throwing my ceramic speakers. That’s not how I work. I’m not a craftsman. I design things to be mass-manufactured. I THINK THERE ARE a lot of talented people in Portland who would be more comfortable operating on a bigger scale, but the whole narrative of Portland-local-craft-smallness keeps them where they are. The people who really are talented craftsmen should do that. But the idea of “craft” can be like the starving-artist narrative—another way for creative people to sandbag themselves. BEFORE THE INTERNET, I would have had to sell my teapots only in Portland, and that would have been horrible. I’ve only sold 150 or so teapots in Portland. Now I can sell stuff all over the world. I haven’t sold more than 5,000 teapots—but that’s been enough to build my company. I THINK OF SUSTAINABILITY IN TWO WAYS. It’s not always about using biodegradable beeswax. It’s also about using materials that are strong and durable, and that actually look better when they’re scratched up and used. Preventing the desire to buy a new object can be more sustainable than making something that decays. I WANT TO CREATE THINGS that are completely mine when they start out, but become half mine and half the user’s. I use materials that change. The stainless steel for the Sorapot isn’t coated, so the tannins from teas will soak in over time. The oil from the users’ hands will make some parts shinier while other parts become more matte. IF I COULD DESIGN ANYTHING, I’d design a car. In fact, that’s my goal. I think all the urban fantasies about the car disappearing are never going to happen. The idea of a product that can move between one and four people and a bunch of stuff anywhere they want to go is just too good to die. Cars now use something like 20,000 parts. I think it should be possible to design a car with 500 parts, and that at some point manufacturing will be ready to produce that design.